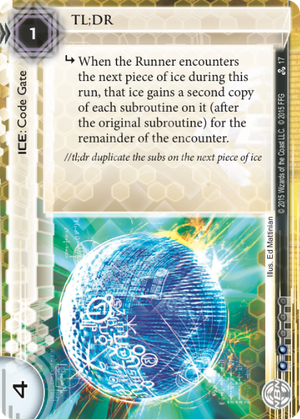 subroutine When the Runner encounters the next piece of ice during this run, that ice gains a second copy of each subroutine on it (after the original subroutine) for the remainder of the encounter. TL;DR is a card that lets you essentially double the subroutines on a piece of ice. It's kind of like getting two hamburger patties on your burger. Like if you wanted to go to Burger King or something and asked "Hey can I have a hamburger from you guys but with an extra patty on it?" and they said "OK." So you pay and wait for a little while. You wait, and wait, for what seems like an eternity. It must take a very long time to prepare another patty. After a while you get impatient and go up to the counter. The guy at the counter says "Hello, welcome to Jack in the Box may I take your order?" and you tell him "I already ordered. I ordered a hamburger with an extra patty on it." and he says "No you didn't." so you order again and pay again. See what I mean? It's like TL;DR making the runner do stuff again that they already did, and costing them more money. TL;DR = TL;DR is like ordering a hamburger twice. Once upon a time, there was a happy little Runner, skipping through the deep dark forest of Jank. The sun grew low in the sky, and the shadows grew long, and the Runner thought it was about time to go home. But where was home? The black trees about them grew darker with every passing moment, and the labyrinthine woods stood threateningly..
Just then, a glittering light came flashing through the trees! A piece of ICE - the first in an four-tall glacier. Still, the Runner was not afraid. Their hand was full up, and Jinteki ICE was porous. They were not rich, but their Mimic gave them hope, and their Stimhack gave them - cash and hope that they might avoid that net damage. False hope, as it were. The first ICE was a glittering yellow code gate, a duplicator of subs - an iridescent teal deer, drinking from a babbling brook that then split in two. Now, our dear Runner didn't have a Decoder on hand, but they decided to press on anyway. They were up at 5 points and they were sure that the twice-advanced server held the last agenda. The second ICE was another teal deer, feet in one brook, drinking from another. Again, the flowing water split - this time into four. Now our Runner was well-versed in the math of exponentiation, and they knew what this would mean. But still, they pushed on. How bad could it be? Do or die - do or die. The third ICE was another teal deer. The brooks split into eight this time. Now the Runner was terrified, and turned to go, but the path had disappeared. The labyrinth held them tight. The last ICE was Komainu. The brooks ran red with blood. tl;dr - made a glorious, janky play and managed to chain three TL;DRs and a Komainu together for (5 x 2 x 2 x 2 = 40) net damage subs. We didn't talk to each other for the rest of the day. TL;DR is a fantastic piece of ICE in concept with a great deal of beautiful combinations. When this was first revealed it was a lot of fun trying to think of how it affected existing ICE, even turning Komainu into a true flatliner. Alas, the problem with TL;DR is that it suffers from exactly the same problems Chum has - It's a Prefix ICE, it can't do anything without a relevant target innermost to it, and any sensible Runner will not continue the run if they were forced to let it fire. Just bare in mind that there is a very, very slim chance you will ever see it work its magic; however, Prefix ICE tend to be the kind you can't afford to let fire, especially TL;DR.
Could you deal with a Hive with 10 ETR subroutines? How about Information Overload with double the subs worth in tags just after a Midseason Replacements? With Faust becoming very popular, Corps are turning to multi-sub ICE in a bid to slow it down, and TL;DR is a real pain in the neck if left unbroken. Compare the strength to rez ration, and in a multi-sub glacier deck you could do a lot worse! Long ago, a little piece of ice named Chum, drifted through a server, connecting itself to whoever it could find. Chum was a lonely ice, but one that brought a sense of strength to those it met. In addition, chum had a dark side, a hidden side, to its persona - those that it attached to had to admire, or at least endure, Chum's possessive nature - who knew a little piece of ice could do so much damage? But yet, as the months rolled on, little chum got a reputation, he was a target - and the bullies found a way to solve little Chum, once and for all. As before, little chum would cause the bullies to back off, but now the bullies came back the following night, bigger and stronger, and instead of getting their revenge on little Chum, they instead would take out the poor piece of ice forced to be Chum's friend - Chum's chum, if you will. And so Chum was lonely again.